Each year, roughly 25,000 young people age out of foster care in the United States without a legally binding, permanent relationship with a family. Youths are said to age out of care, or emancipate, when they are forced to exit foster care due to reaching the age of majority, which is anywhere from 18 to 21 years of age depending on the state. From 2000 to 2009, the number of youths aging out of care increased by 46%, and though the number has finally begun to decrease over the past five years, youth emancipation continues to represent one in 10 exits from foster care (US Department of Health and Human Services, 2013). Because aged-out youths often lack concrete resources and social supports, they are at risk for a number of adverse outcomes, including increased rates of unemployment, low educational attainment, reliance on public assistance, behavioral health symptomology, poor physical health, homelessness, unplanned pregnancy, and criminal justice involvement (Courtney, Dworsky, Cusick, Havlicek, Perez, & Keller, 2007). In fact, the most statistically at-risk youths in the United States today are former foster youths who have aged out of the child welfare system (Muller-Ravett & Jacobs, 2012). The Jim Casey Youth Initiative estimates that on average, for every young person who ages out, taxpayers and communities pay $300,000 in social costs over that person's lifetime. With approximately 25,000 young people aging out each year, this amounts to roughly $7.5 billion in total costs. — Allison E. Thompson, MSS, LSW, is a doctoral student in the University of Pennsylvania School of Social Policy & Practice. — Johanna K. P. Greeson, PhD, MSS, MLSP, is an assistant professor in the University of Pennsylvania School of Social Policy & Practice. Avery, R. J., & Freundlich, M. (2009). You're all grown up now: Termination of foster care support at age 18. Journal of Adolescence, 32(2), 247-257. Courtney, M. E., Dworsky, A., Cusick, G. R., Havlicek, J., Perez, A., & Keller, T. (2007). Midwest evaluation of the adult functioning of former foster youth: Outcomes at age 21. Chicago, IL: Chapin Hall Center for Children at the University of Chicago. Greeson, J. K. P. (2013). Foster youth and the transition to adulthood: The theoretical and conceptual basis for natural mentoring. Emerging Adulthood, 1(1), 40-51. Greeson, J. K. P., Garcia, A. R., Kim, M., & Courtney, M. E. (2014). Foster youth and social support: The first RCT of independent living services. Research on Social Work Practice, DOI: 10.1177/1049731514534900. Greeson, J. K. P., Thompson, A. E., & Kinnevy, S. (2014). 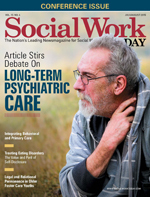 Natural mentoring of older foster care youths: Behavioral health benefits. Social Work Today, 14(4), 10-13. Muller-Ravett, S., & Jacobs, E. J. (2012). After foster care and juvenile justice: A preview of the Youth Villages' transitional living evaluation (policy brief). MDRC. Retrieved November 21, 2014, from http://www.mdrc.org/publication/after-foster-care-and-juvenile-justice. Samuels, G. M. (2009). Ambiguous loss of home: The experience of familial (im)permanence among young adults with foster care backgrounds. Children and Youth Services Review, 31(12), 1229-1239. Semanchin-Jones, A. S., & LaLiberte, T. (2013). Measuring youth connections: A component of relational permanence for foster youth. Children and Youth Services Review, 35(3), 509-517. U.S. Department of Health and Human Services (2013). Administration for children and families, administration on children, youth and families, children's bureau. The AFCARS report—Preliminary FY 2012 Estimates as of July 31, 2013 (No.20).